Truss is designed for a specific load and usage and is generally a reliable, maintenance free product as long as it is used within the design parameters. Review the loading figures carefully as they are a guideline to loading and rigging the truss. This engineering data will help determine the type of truss required for a specific application. Structural engineering reports are available from Applied. These reports are available for reference and should be in the users’ possession. The reports show the maximum loads for given spans of truss and also indicate the maximum span of the truss being used. Truss is designed to provide years of reliable service when it is handled with care. Do not drop truss, as this may dent the chords or deform the end plates causing a poor connection between sections. Do not drag truss, as this will cause flat spots or pitting and subsequently lower the load capacity of the affected members. When loading or unloading truss, secure it for transport to prevent rubbing or bouncing. When using a forklift, take care not to puncture the diagonals or chords. Always lift truss from the bottom chords. All trusses must have an identification label attached in order to relate the following information; item number, order number, fastener requirements and load specifications. The label must not be removed. This label will also allow for proper record keeping of annual inspections. All truss must be inspected, no exceptions. ANSI E1.2-2012 Entertainment Technology Design, Manufacture and Use of Aluminum Trusses and Towers requires visual inspections prior to each use by a competent person and yearly inspections by a qualified individual for possible structural issues. Records of the inspections, for each truss, should be kept by the owner. Any truss that does not pass a visual inspection, should be marked ‘DO NOT USE’. The damage should be flagged or, if necessary, the truss should be taken out of service. Truss that is damaged can be returned to Applied for evaluation and possible repair. The truss is supporting vertical loads only. That the truss ladders are oriented vertically and no lateral loads are applied to the truss. The truss was analyzed as a simple span beam with supports at truss ends only. The truss was analyzed for static loads only. All loads are applied centered between the ladders. All loads and supports are to be located at the panel points of the truss only. 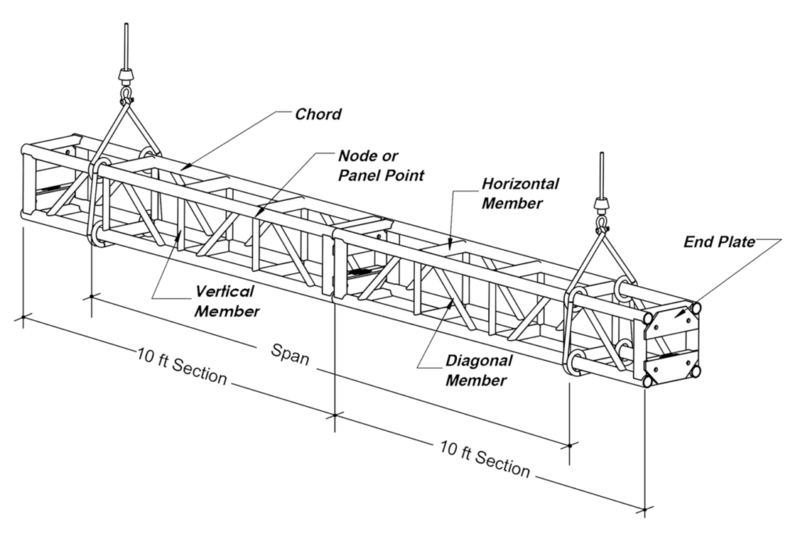 Self-weight has been considered in the analysis of the truss. Allowable loads based on 2010 aluminum design manual.